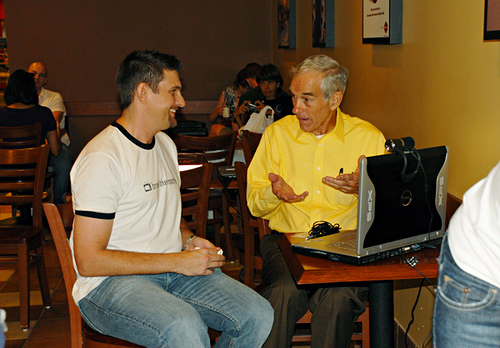 In Minnesota, during the “Rally for the Republic” in September 2008 was the first time I met and interviewed Ron Paul. After signing over 1,200 books for supporters, he was a bit exhausted. Yet, he graciously sat down with me to answer questions. He didn’t know me and he was initially apprehensive, but as we chatted for this exclusive live BreaktheMatrix.com broadcast Dr. Paul began to relax . He was drinking iced tea, laughing and sharing his views about his relationship to this new and exhilarating rEVOLution. Being from the South, I had a sense of sitting on the front porch having a meaningful conversation with a close friend. From that interview in 2008 I’ve realized that what made him unusual wasn’t just manifested externally through his consistent voting record and willingness to say what most wouldn’t dare. The outward expression reflected something underneath that seemingly couldn’t be intellectualized. That’s what I wanted to find out about Ron Paul. How was it that just being himself ignited the most impactful political movement of my lifetime? This gave purpose to an interview premise: the idea of learning the intrinsic way he sees himself and his relationship to the rest of the world. What I’ve observed about Dr. Paul is his resistance to self promotion or taking the credit and never personally attacking others on any level. A year ago we did an interview for Rare.us where Dr. Paul began to touch on some of these elements by saying, “I think we are all born libertarians”. To parlay off of those Rare podcasts Dr. Paul joined me last month on The Flow with Kurt Wallace to discuss his new book, Swords into Plowshares, in which he reveals intensely personal stories of himself. In The Flow interview (posted below as “The Magnificent Obsession of Ron Paul”) he discusses how war is tailored to special interests and propaganda versus the peaceful nature of people. He reveals why he didn’t really want to be president, yet worked harder than his opponents to get elected. Dr. Paul, also, talked about practicing medicine, medical philanthropy and what it was like for him to deliver babies. He explains why the power of voluntary answers and free markets serve the benefits of society. Most interesting was the special moment when Dr. Paul shared why he believes in doing things from the principle of anonymity. He said, “If you do it from the heart and you’re expecting a lot of praise then you’re sort of charging something for it.” He then refers to one of his favorite examples, a book/film called Magnificent Obsession. He also talked about what he’s most proud of in his son, Rand Paul — and it has nothing to do with politics. 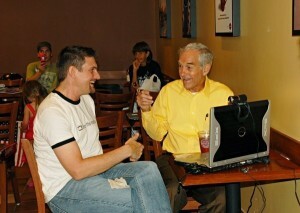 I believe that the richness of Dr. Paul isn’t simply in the actions he’s taken. Those are specific ways to observe the outward manifestation of understanding him in relationship to the world. They’re demonstrations of how we should respect each other’s perspective yet not be afraid to point out the purity in being true to ourselves by way of libertarian principles. What I ultimately got from this interview was that Dr. Paul reveals more about himself by what he didn’t say – his expression of being anonymous or more specifically absence of ego. He is famous. But, he (himself) doesn’t feel the fame of “Ron Paul” as he knows that he’s a messenger of liberty and not the message. The fame is merely a tool to spread that message. The Flow with Kurt Wallace is about exploring people and who they are rather than what they’ve done. But, during this interview I realized that there is nothing that we need to know about Ron Paul, other than he practices anonymity. I am SO proud to be a native constituent of Dr. Paul’s. For most of my life, his unwavering commitment to speaking truth – and yielding in all things to principles – has shaped how I interpret my place in this world and how I understand my political voice. © 2015 Kurt Wallace. All images are copyrighted by their respective authors.